Hey dolls! 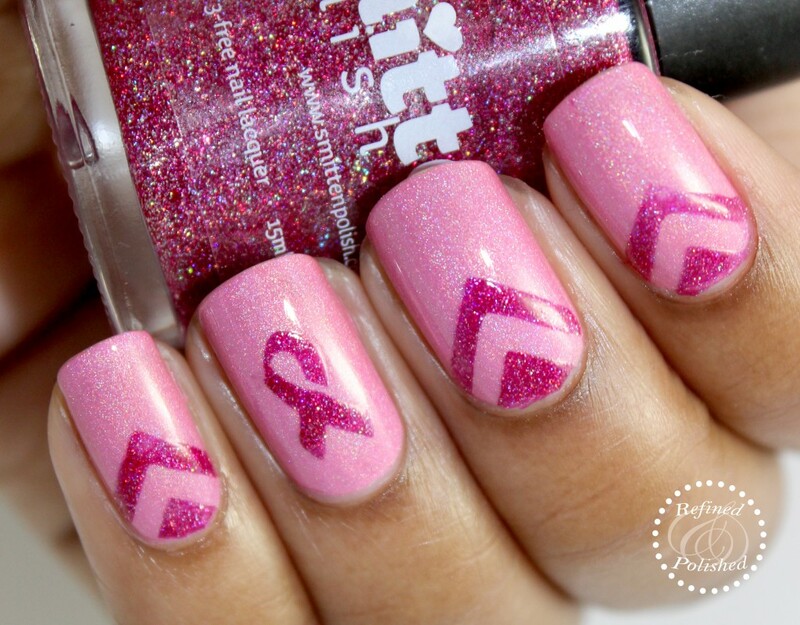 This week’s breast cancer awareness mani features two shades from Smitten Polish. I wanted this look to have a lot of sparkle, so I went for two holos. The look started with a base of Smitten Polish Frangipani, a soft pink holo. After Frangipani dried, I used single chevrons and Smitten Polish Her Name Was Rose to re-create a cool triangle look I saw on Wacky Lacki several weeks ago. The awareness ribbon nail vinyl was used on the accent nail. I absolutely love this look and it is my favorite of the breast cancer awareness manis I’ve done so far this year. The two Smitten Polishes compliment each other perfectly! Researchers have identified many risk factors for breast cancer, including some that cannot be changed. To learn more about these risk factors, feel free to read this article from the American Cancer Society.